The Ladd Group exclusively lists an impressive portfolio of homes in Tetherow. 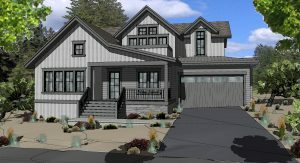 We have several new custom homes being built in the exclusive Cascade Vista neighborhood right now. Please see below for available & upcoming homes! Reach out with any questions to Steve LaCrosse, Cascade Sotheby’s International Real Estate Broker & Cascade Vista Lead Agent. steve@bendpropertysource.com // 541.280.2132. We are also at the Tetherow Real Estate Office 7 days/week. Stop in to say hello, gather information or request a private tour. Located near the top of Tetherow, the Cascade Vista neighborhood offers commanding views of the Cascade Mountains and the 11th fairway and green at Tetherow. These single family detached homes on individual lots offer the designs, amenities, finishes, and quality that you would expect in a community of this caliber. Offering immediate access to open spaces, Tetherow lends itself to adventure. Enjoy direct access to the hiking trails (great for any age! ), mountain bike parks, Mt Bachelor Ski Resort and world-class mountain bike trails in the Deschutes National Park Trail system. With only 15 homesites total and 6 homes being built here already, the Cascade Vista neighborhood offers a sense of tight-knit community with opportunity for growth and adventure! Bend is all about lifestyle, and with an HOA covering all the necessities and a life at Tetherow, you can easily be connected to fun, nature, and unforgettable experiences. Take a breath and enjoy! We invite you to visit Cascade Vista and discover where your next adventure begins today! 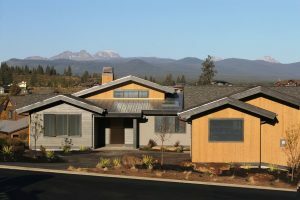 Located on a gently elevated homesite in the coveted Cascade Vista neighborhood in Tetherow, this sophisticated traditional Northwest home is newly completed by Greg Welch, one of Central Oregon’s leading builders. The design takes full advantage of the mountain views & the beautiful natural setting backing to Alpine Park. In this Silver Level Earth Advantage home, you can enjoy multiple outdoor living spaces, an office & master on the main level and 3 bedrooms, a bathroom and bonus room up, all with stunning views. A beautiful custom build by Greg Welch Construction in the highly desirable Cascade Vista neighborhood of Tetherow is newly completed. Traditional roof lines blend nicely with barnwood exterior, clean lines, high ceilings and light, bright finishes. Large windows throughout allow for incredible views from every room of the house: Cascade mountain views from the front of home and views of 20-acre Alpine Park from the master, backyard and upstairs bedrooms. Master Suite on the main floor with three additional bedrooms upstairs plus a bonus space makes this a must see home. 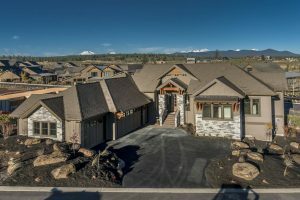 This stunning new move-in ready custom designed home takes full advantage of this mountain view lot in Tetherow Resort. 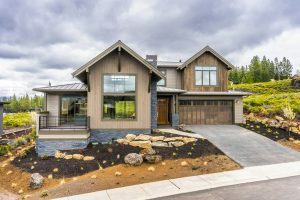 Crafted by Ollin Construction, has been thoughtfully designed with a timeless Northwest exterior blending beautifully with a light, bright, open floor plan. 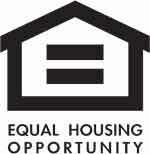 Primarily single level living, etion date. Dominant features include primarily single-level living this home as a large open living space, with an enormous rear deck with mountain views and main level master with access to the deck. A second bedroom, large guest bath and office complete the main floor. The lower level offers a bonus room, bedroom & bath and a beautiful lower level covered terrace perfectly designed for a hot tub. Welcome home to this custom build by Visionary Homes, located on an exceptional lot in Tetherow’s Cascade Vista neighborhood. 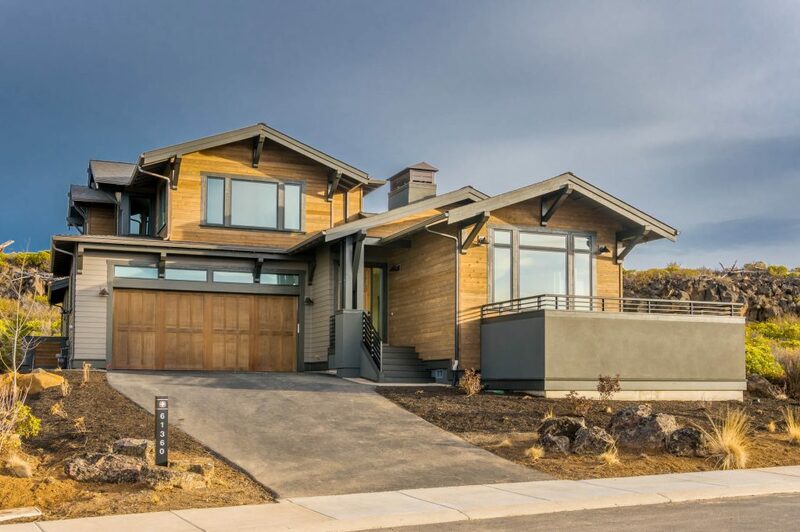 A modern exterior w/ clean lines & ample windows is situated on a corner lot w/ Cascade Mountain, golf & park views. Inspired design features a main floor master, a great room concept opening to a custom, tiered rear yard that backs to common space & Bend Parks land. Upstairs: three bedrooms & three baths with a bonus room and an expansive deck boasting stunning views & gas for a fire pit & BBQ.